Is Just Eat share price fall a buying opportunity? Shares in takeaway ordering specialist Just Eat (JE.) have dropped from the all-time high of 890p marked in February by more than 20% to 686.6p (6 Mar). Is this a buying opportunity or is the company’s new investment strategy too risky? Just Eat generates sales from its online platform, which is used by hungry consumers to find and order takeaway food. One of Just Eat’s advantages is its asset-light business model, but this will change as the company moves into handling delivery services for restaurants, essentially following in the foot steps of the likes of Deliveroo. Initially this will involve investment of £50m in delivery services and branding. The UK, Canada, Australia and New Zealand are the prime targets for delivery services, as well as developing markets. The move will materially hit earnings before interest, tax, depreciation and amortisation (EBITDA) in 2018 as it absorbs staff and transportation costs. This is anticipated to fall year-on-year from £226m to between £165m and £185m. JP Morgan Cazenove analyst Marcus Diebel says the delayed move into delivery is bad for Just Eat as Deliveroo and UberEats have taken a significant share of the high/mid-price segment, particularly outside London. He argues the company will be exposed to more lower-priced restaurants. ‘Given these developments, the UK is less stable than previously anticipated and we now value the UK at £2.4bn vs. £4bn before,’ comments Diebel. There are plenty of bulls in support of Just Eat, one of whom is Peel Hunt analyst James Lockyer. He forecasts adding delivery services will expand the market size from £23bn to £41bn, helping to drive earnings in the future. Lockyer forecasts sales in 2018 will rise 5% to £717m and climb 8% higher in 2019, but EBITDA is expected to fall 18% in both 2018 and 2019 due to the investment. We believe Just Eat’s strategic move makes sense but recognise the increased risk in the business that could manifest itself in several ways. The company may need to plug more money into delivery services than expected and there are execution and competition risks. 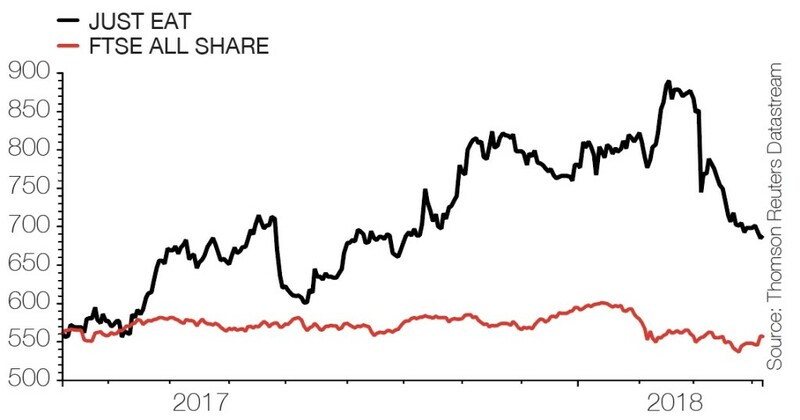 Just Eat currently trades on 26.7 times earnings per share in 2019, down from 34.6 times in February. We think this is still too expensive until more details are provided on how the delivery services will be rolled out. Could French Connection return to the dividend list? Are directors’ interests really aligned with shareholders? Which investment trusts have beaten the market’s first quarter slide? What should I do with my 25% tax-free pension lump sum? Is the AA on the road to recovery?